Since 2012, The Hunger Games has come on scene and lit aflame admiration in the hearts of many admirers (I, for one, have never been one of them, but I digress). In 2015, those flames are beginning to die down. 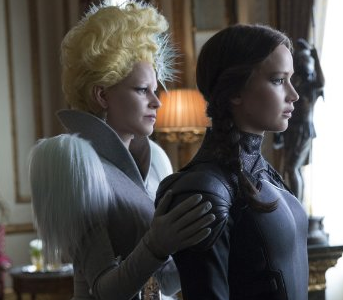 Like Part 1, The Hunger Games: Mockingjay: Part 2 is graced with some fine acting and is sharply produced. Until the very end, there are no noticeable lulls in pacing or appeal. But assuaging all conflict in a dystopian tale of war and woe is an altogether different matter when it comes to satisfying the sweet spots of viewers. And of course, we have to ask the question: Is it right to bring all conflict to an end? Isn't it more life-like to leave a little behind? 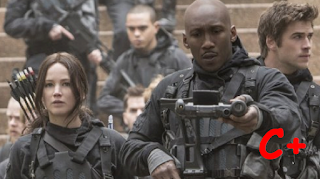 In the three movies before this one, Jennifer Lawrence’s “Katniss Everdeen” had reached superstar heroine status; in this movie, both she and her esteemed character are...somewhat less than focused on their objectives. Perhaps too many games have gone on and too much blood has been shed—or perhaps the near-misses on the battlefield, coupled with a browbeating message about how corruption can only end in overthrow, has wearied audiences. Whatever. The originator of the series, author Suzanne Collins, wrote her bestselling trilogy for the youth, but as this film takes on more of a woeful philosophical examination of the corruption of human nature, audiences won’t find it as seamlessly packaged for intended viewers as the previous films. But there is another problem: Director Francis Lawrence should not have split the finality into a separate movie. There simply isn’t enough film here for that. What he should have done is cut down focus on non-essentials and bring this chaos to a more abruptly instead of dragging it out. And since each movie has become more reprehensibly dark and un-relatable, viewers immediately reflect on the fact that only one ending could possibly satisfy them. Failing that, everything would feel like a waste. But that spells predictability, which means we have a catch-22 here. There wasn't much Part 2 could do to save itself from that fate. But perhaps I’m being a little too hard on the film, so I’ll back off. From here, I'll just say that Part 2 is more concernedly lacking the witty humor afforded by previous films. Woody Harrelson, as the voice of reason in his character “Haymitch Abernathy,” is all but silent now. Add in some CGI-generated, sewer-dwelling man-dog hybrid creatures and the film fast becomes less realistic the further in you watch. What I liked about Part 2 was Julianne Moore! As a mysteriously self-serving rebel leader named “Alma Coin,” she threatened to add great dimension to what was a by-the-numbers presentation. She and Donald Sutherland are the only presences that give this movie the dimension it needs to be something more. And as easily hated as his “President Snow” is, you still can’t help but be taken aback by the fact that he is so charming to listen to and reason with that you want to find at least one reason to cut him some slack and side with him on. His honesty and intellect are the things that completely contrast his spellbinding savagery. I love it! What has remained in place throughout every movie so far: the ever-present conflict between Josh Hutcherson’s “Peeta Mellark” and Lawrence’s Everdeen. What is heard – but doesn’t even need to be stated – are the soft anchorings of a love triangle between Everdeen with Liam Hemsworth’s “Gale Hawthorne” and Mellark. I didn’t need it, but I can totally respect it. In conclusion, Mockingjay: Part 2 is not a marvelous film. With all of the emotional exchanges and power struggles, something was lost along the way. It didn't nail everything down like it needed to. But what it still left me with was a sobering reminder of the need to question who is really looking out for our best interests and those of our loved ones. I felt like that was enough.